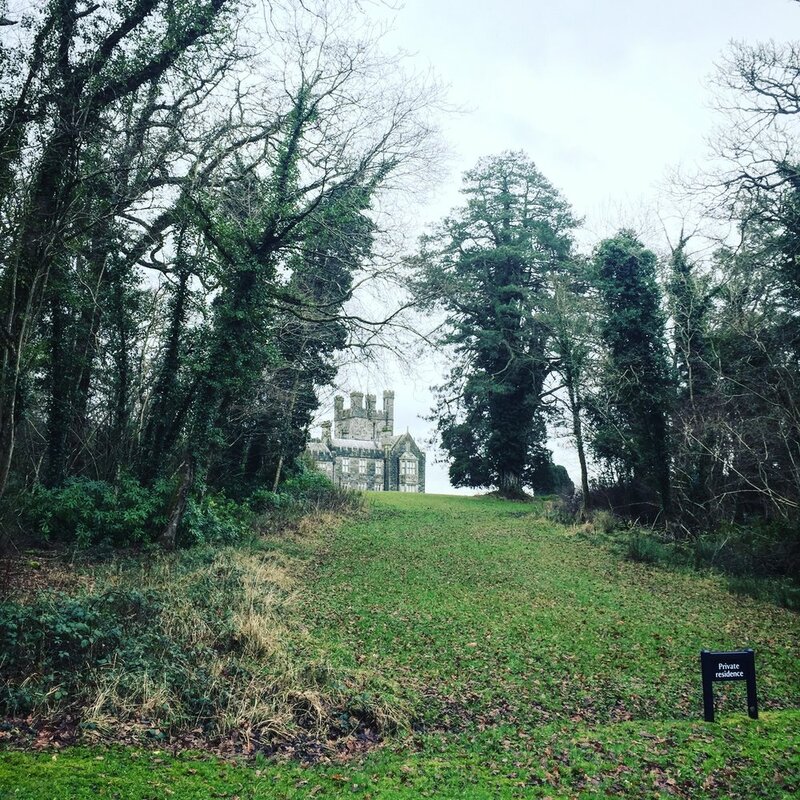 Nestled deep in the heart of the Fermanagh lakelands - 30 minutes south of Enniskillen - lies Crom Estate, a beautiful 2000 acre demesne that's been home to the Earls of Erne for nearly 350 years. And yes, you guessed it, there's a flipping cracker castle there. Making our way up through Fermanagh recently, our decision to go check out the castle was totally unplanned. It was somewhere people had told me about in the past; one of those ones you say you'll stick on the list but never end up getting round to for one reason or another. So with no reading-up on the place in advance, we didn't realise the castle isn't actually fully accessible to the public. Though the surrounding estate and walking paths are managed by the National Trust, the castle is still the home to the Crichton family, the current Earls of Erne. The only way of getting a nosy around it is by booking the West Wing for an overnight stay, private function or wedding...or by booking onto a private group tour or dinner. And you guessed it, we had booked none of the above. Doh. Nonetheless, despite the looming clouds and sporadic rain that day, the surrounding estate made for some great exploring over the next few hours. Signposts will guide you from the estate's main entrance through to the car park. You'll eventually come to this beautiful row of terrace houses with the smell of turf bursting from their old chimneys for a sensory overload. After a quick bit of Googling (and pressing our faces against the windows for a better view), we discovered they're holiday homes for rental. Check out this link - a great reason for us to come back down again soon. On the other side of these, down at the water, we spotted what looked like a number of gated storage bunkers, possibly for locking small boats in. A quick squint through the gaps in the wood (and another quick Google search) and we found out they were actually glamping pods. Check them out (pics borrowed from their website - that's not me with the binoculars). Eventually you'll come upon the ruins of the original Crom Castle. Remember I said 'home to the Earls of Erne for 350 years'? This was one of their original abodes - the current Castle is only 197 years old. Only, he says. ...turns out it's actually two trees. 'Yew Trees' as t'internet has just informed me and two of the oldest in Ireland. Try your best to resist climbing these and more importantly, watch out for that dangerous red-backed sheep from earlier, now masquerading as a Hobbit in his tree home. ...and eventually, first glimpses of the awesome castle. Right, let's get a kitty going and we'll rent the West Wing for a party. Who's in? Everyone has seen Fawlty Towers or at least heard of it - the classic 70s BBC sitcom about the hilarious escapades of Basil Fawlty (John Cleese) and his team as they haphazardly attempt to run a hotel in the English seaside town of Torquay. Skip forward 40 years and we were experiencing something similar first hand. 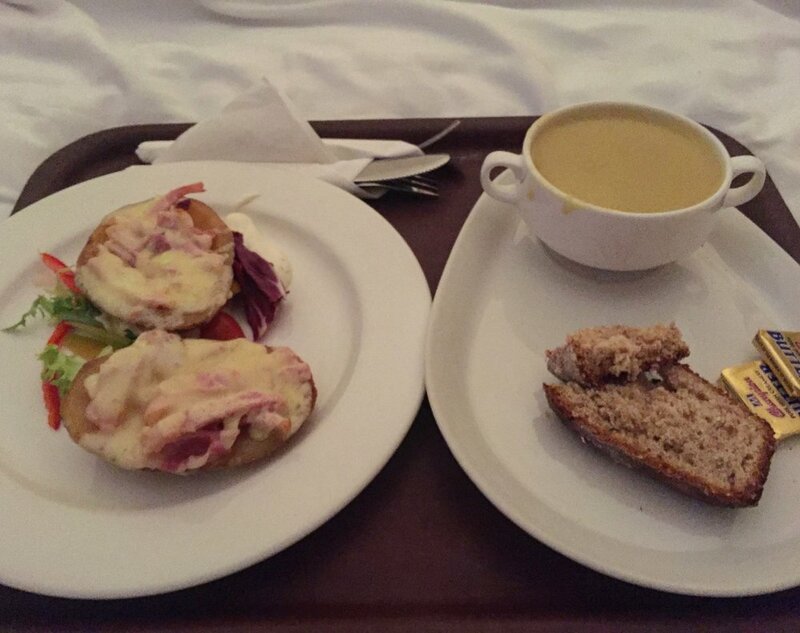 The night before our visit to Crom Estate, we checked into our hotel in Lisnaskea. A friendly receptionist had us checked in and into our room in no time - and for £49 for two people including breakfast, the room was surprisingly nicer than what the cheapness may have brought. As well as a comfy double bed, there was also a handy single bed (which our bags naturally took over) and despite no bath (I flippin' love a hotel bath) the shower was great. Overall, the room was both good and very clean. 8.30pm: Realising no phone in room, I walk down to bar to get menus. Back to room to decide. 8.35pm: Back to bar to place order for starters: cheesey potato skins and the soup of the day with wheaten bread. Oh yes. 9.05pm: 30 minutes is a bit long for two simple starters. Back to the bar, makes eye contact with young barman who shouts across the room, "has that not come yet?". Queue all the locals to look my direction. "No", I reply. Locals look his direction. "Let me check", he states. I quickly start reading a menu again, too tired and hungry to speak to strangers at this point, in fear I get asked what I ordered. 9.08pm: Barman returns, confirming his colleague forgot to put the food on, but he'll bring it up to our room within 10 minutes. 9.25pm (about 5 mins past the promised time): Door knocks. Food is here. I crawl to the door, fading away by this point. 9.21pm: First impressions - looks decent. Fair enough there could have been a bit more salad and it looked like they gave us an already-eaten bit of wheaten bread, but happy that it's finally arrived. Oh wait, they've gave us two sets of knives and forks. 9.23pm: I'm down in the bar again, telling them we've made a bit of a mess trying to eat the soup with a fork. 9.26pm: Back in the room, spoon in hand, we finally getting stuck in to our starters nearly an hour after ordering them. Showered, changed and ready for more food, we head down to the bar, hoping for a less comical experience. I realise at this point my car's still parked on the main street out the front of the hotel, having abandoned it there during the tired and hungry check-in earlier. Back to the room I go to grab the key, returning to reception to inquire about the hotel car park I have seen a sign for earlier that day. Me: "Hiya, is there a hotel car park?" Receptionist: "Yes, there sure is, it's just round the back"
Me: "Great. How do you get into it, where's the entrance?" Receptionist: "What way are ya pointing?" Me: "Me? You mean where's my car?" Receptionist: "What way are you pointing. Your car?" Me: I think I'm pointing right (points right) - I was hungry earlier, it was a bit of a blur. Receptionist (worried look on her face): "Oooohhh". You see the car park is down to the left (points other way, then stares at me in silence). Me: (not knowing what's going on here, I mean it's a wide two way street out front): "I can just turn the car round, can't I?" Receptionist: "I suppose if you go up to the roundabout at the end of the road, go round that, come back down and then just turn left at the end of the street you'll see a sign for the car park". I give my thanks (likely a really weird face on me still, confused with why that was all very complicated), leave the hotel and get into the car. As I approach the roundabout I get the feeling that Harry Potter must've had when he ran at the wall of Platform 9 and three quarters...not knowing what was about to happen. Unfortunately, nothing did happen and in no time I was on the road round to the back of the hotel. Turns out there was no obvious car park sign though. After a first failed attempt where I ended up in someone's back garden after driving up what looked like a long hotel-esque land - I managed to find the back of the hotel. There was a tiny sign to the left of this pic above, so I knew I was definitely, well highly likely, on hotel grounds. Car abandoned, I just needed to get back into the hotel again before a Missing Persons Report is filed on me. Advice to anyone in this predicament: don't waste five minutes using your nails to pull open the door that has no handle - it's locked. Take the very dimly-lit, Crimewatch-reconstruction-type alleyway instead - it's nearly impossible to see in the photo above. Then click BACK TO BLOG below to read more on the best of Northern Ireland.